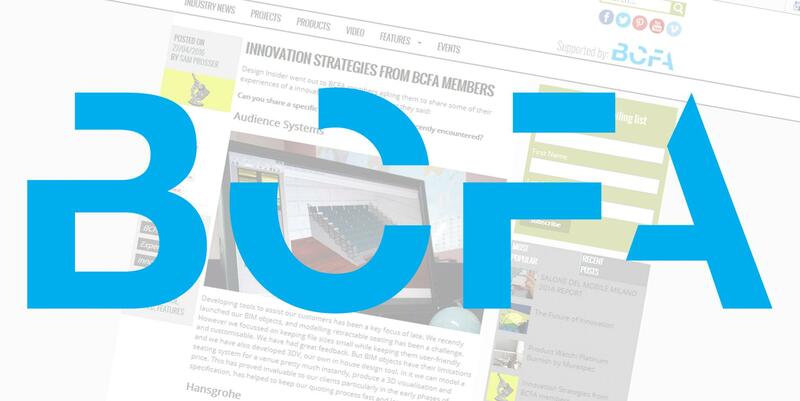 As members of the BCFA, the trade association for some of Britain’s leading furniture designers and manufacturers, we’re delighted to be featured in a special edition of their “Design Insider” magazine, focussing on innovation. The article picks up on our industry-leading work developing functional and useable BIM models as well as a 3D visualisation tool for retractable seating, giving us a suite of tools to benefit designers, specifiers and clients. It’s also fascinating to read what else British furniture and fabric designers are up to – from Gresham’s library without books to Morgan’s use of 3D printing. Although from different areas of the furniture industry, it’s interesting to see the innovations that impact us all – from the development of new fabric technologies, to the continued rise of LED lighting. Developments in printing are also having a huge impact – as the “concrete” melamine writing tablets in our own showroom demonstrate! Richard Grohe of Hansgrohe sums up innovation well: “An innovative idea is simple, obvious and self-explanatory. Life is complex enough so innovations must be simple and that is what makes their creation so complicated.” We agree wholeheartedly with that, Richard!